We stayed here for one night on our way through Texas. The office staff was very friendly when we checked in. The roads and sites are gravel and the sites are long and level. There had been a lot of rain and the grassy areas were a little muddy, but the pad itself was fine. There was also a concrete patio. The cable and WiFi worked well. We got 4 bars 4G with ATT. We will definitely stay here the next time we come through this area. 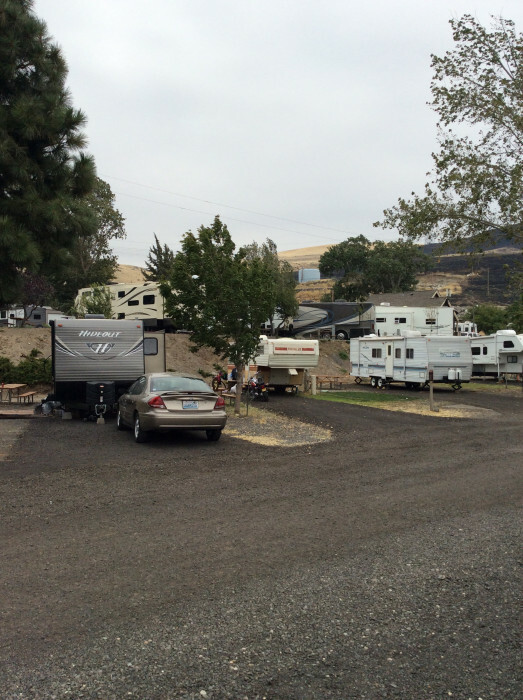 We camped at Whistle Stop RV Resort in a Fifth Wheel. 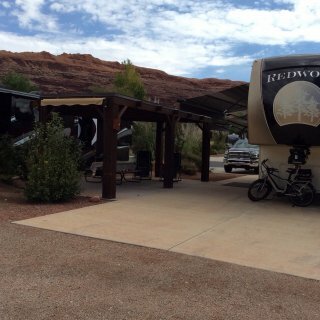 We stayed in this park for one night because it is very convenient to I40. 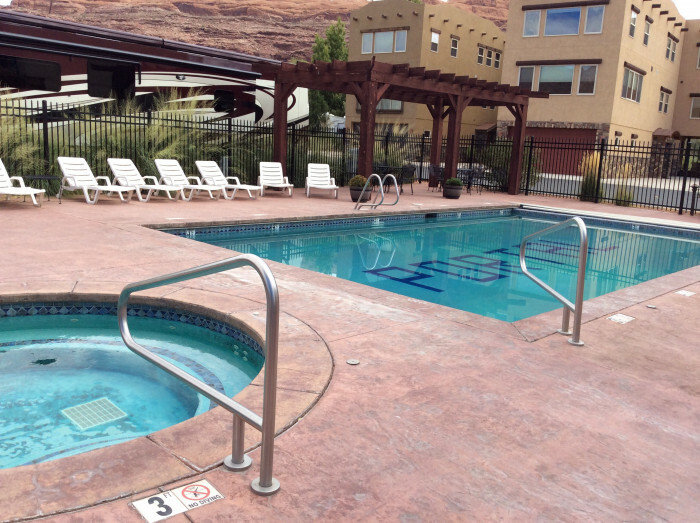 The staff are very friendly and the park is clean and well maintained. The streets are asphalt and the pull-thru sites have a level concrete pad and patio, with an asphalt parking area. 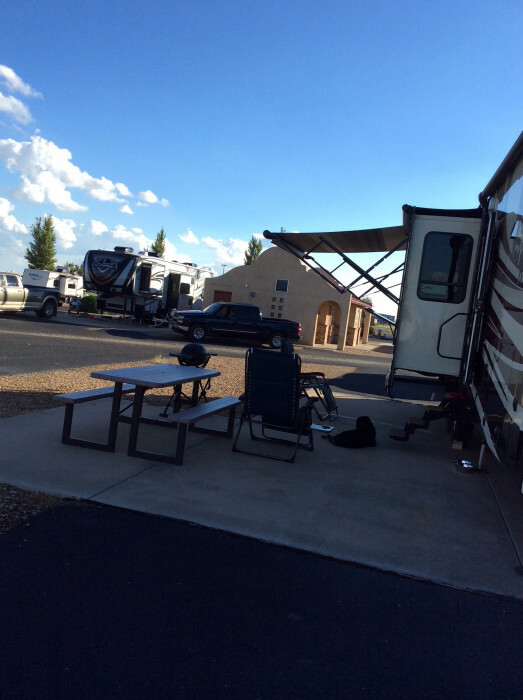 This configuration works better for motorhomes, as the pad is in front of the parking spot, but it's still a very nice setup. The utilities are good and the WiFi and cable both work well. We got 4 bars 4G with ATT. The laundry room was clean and cost $1 to wash and $1 to dry for 1 hour. We would definitely stay here again. We camped at Oasis RV Resort in a Fifth Wheel. This park Is very convenient to I-25 but far enough away that we didn't hear any road noise. 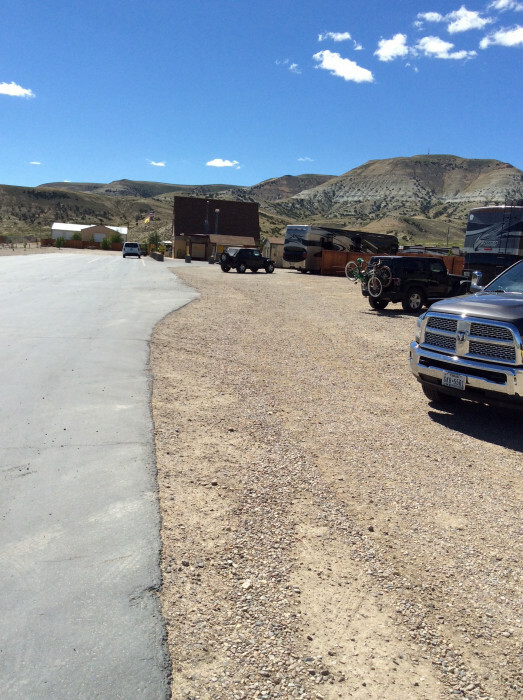 The roads and sites are gravel with a concrete patio at each site. We were in a pull-thru site but there are also back-in sites available. 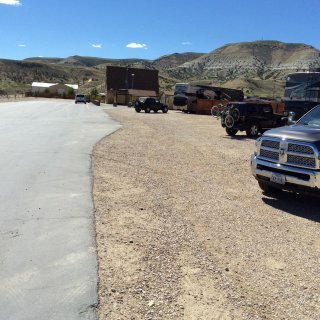 Our site was not very long so we had to park our truck sideways in front of it. No cable, but we pulled in lots of stations OTA. We had 3 bars 4G of ATT. The park WiFi is so-so. It worked one minute, then wouldn't connect a few minutes later. They have an off-leash dog park, a walking trail around the park, and some interesting art work and antique pieces scattered throughout. 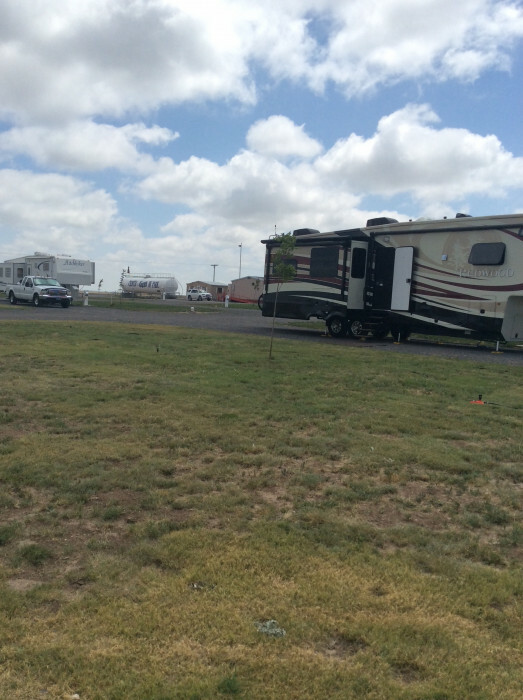 We camped at Santa Fe Skies RV Park in a Fifth Wheel. When we first entered the park, the road was asphalt and it looked very nice. Then you turn into the RV section and everything is gravel. The sites are all back-ins but the roads and sites are wide so it is easy to maneuver. 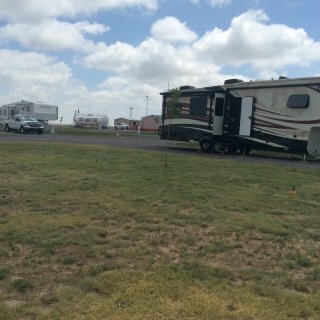 In fact, our site was wide enough to park our truck next to our RV. There is a small grass/dirt strip between each site. Our site was higher in the middle and sloped down to the sides so that when we were finished leveling, our tire were off the ground on the utility side. We got several OTA channels and 3 bars 4G with ATT. The park WiFi was unreliable. 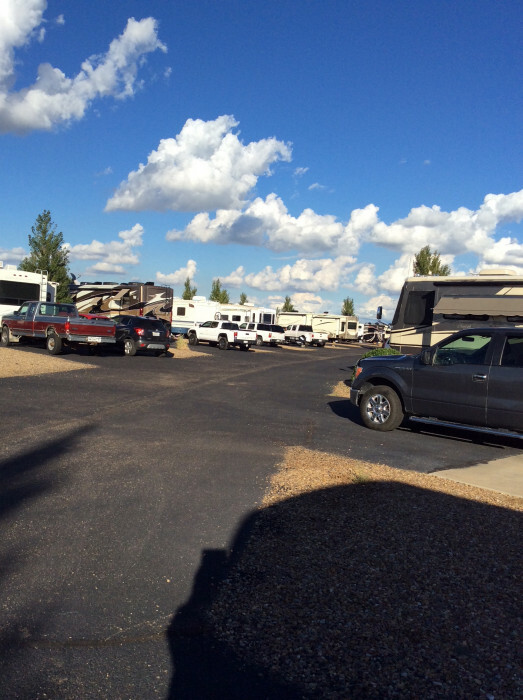 We camped at Mountain Landing Suites & RV Park in a Fifth Wheel. Chimney Rock National Monument is definitely worth the trip. They have 2-hour guided trips that take you through the ruins. They even have free, shaded kennels if you need a spot for your dog. Bring water as there is no running water on site. We stayed in the premium side of the park which consists of sites that are privately owned and rented out when not in use. 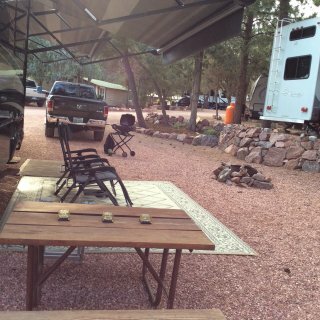 Our site was very spacious with a parking spot and a covered patio, though not all of the spots have shaded patios. The landscaping was very nice and the park was quiet. The pool was only available for the premium sites which is why we stayed on that side. It was very nice and not very busy. We had it to ourselves every time we went. 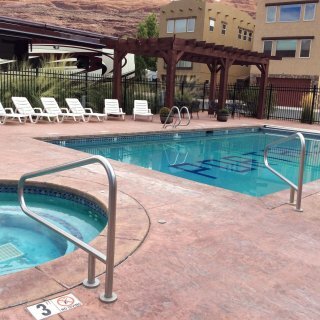 It's a great way to cool off in the Moab heat. The pool for the other side is almost done and will be opening soon. There was an off-leash dog park on each side. We had 4 bars of 4G with ATT, but didn't use it as the park WiFi was very good. The only ding I would give is that the cable is pretty fuzzy. 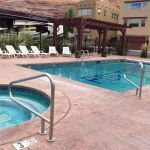 We really enjoyed our stay here and would definitely come again. 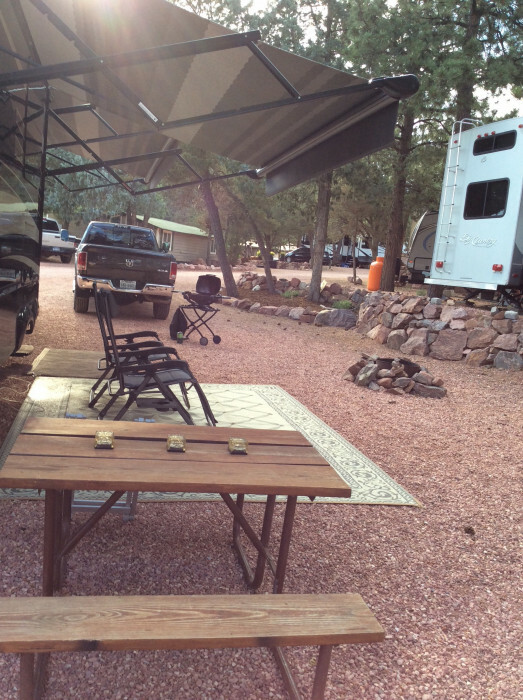 We camped at Portal RV Resort and Campground in a Fifth Wheel. There's a great paved bike trail that you can access right across the highway from the park. One branch runs along the Colorado River for a couple of miles and the other branch goes along the highway past the entrance to Arches National Park. The park doesn't want you to use the WiFi for downloading, which is to be expected, so if you need to download, head into town to the library. They have the fastest public WiFi we've encountered in our many stops. This is a basic park with great access from I84. Our site was gravel, fairly level, and very long. No OTA channels but satellite access was good. 3 bars 4G with ATT. Their WiFi was good. It was windy, as you would expect in this area but we had a lovely view over the Columbia River. We would stay here again. Good overnight stop. 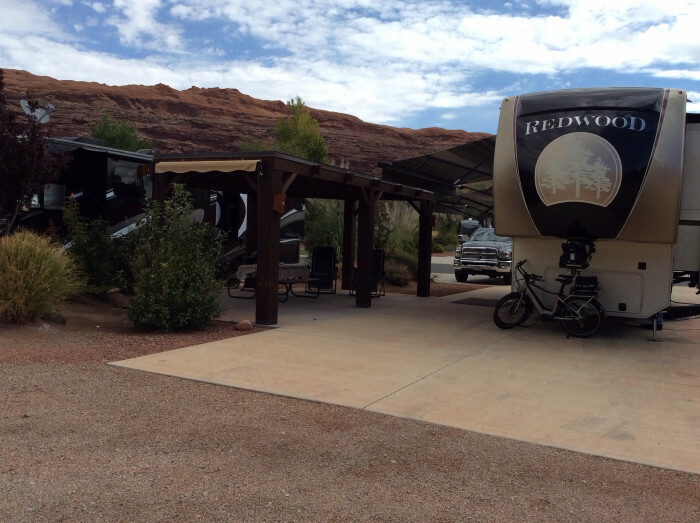 We camped at Rufus RV Park in a Fifth Wheel. This is a very pretty park with easy access from I84 but as others have said, use exit 17 rather than 18. Otherwise, you will be dealing with low trees and a narrow bridge. 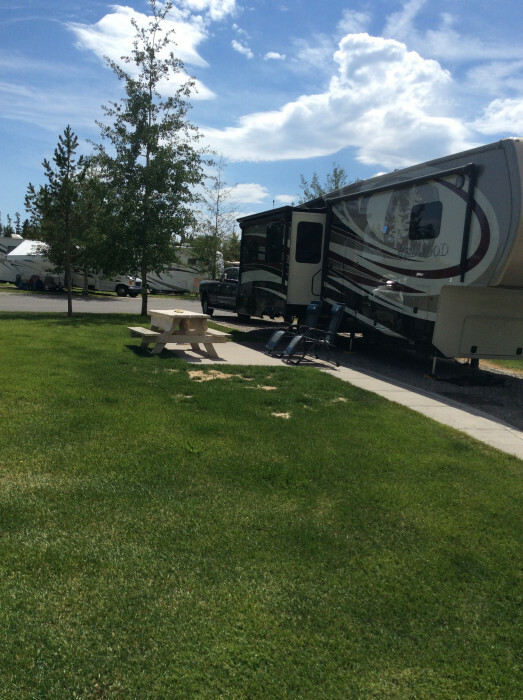 The sites are asphalt with grassy yards and the park is very well maintained. Even the long terms spots looked nice. My only complaint is that the sites are very close together. When you have two large rigs next to each other with slides extended, the yard feel very cramped. The WiFi was good. We didn't use the cable because you had to use their box, but we could pull in the Portland stations OTA. We would definitely stay here again. 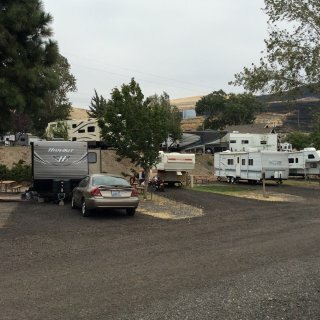 We camped at Sandy Riverfront RV Resort in a Fifth Wheel. Just 15 min. to Multnomah Falls, but go early. The parking lot fills up. There's a Camping World just across I84 and a truck wash that does RVs for $1.50 a foot. Would have done it ourselves if we'd realized that the park allowed it. Very nice park within walking distance of Cannon Beach. We had 1-2 bars ATT, but didn't need it since the park's WiFi was pretty good. 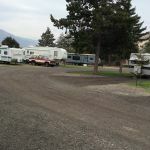 Sites are paved with grass/dirt yards and lots of trees. We were able to find a gap and get satellite service, but the park also has cable. The park was very busy with lots of families, so book early. We would stay here again. We camped at Cannon Beach RV Resort in a Fifth Wheel. Our level, paved site was close to the beach. The yard was dirt/gravel with partial shade. We had no ATT signal, but could go to the park store and use their WiFi. We pulled in 2 OTA channels and were able to get a satellite signal. We could hear the surf from our spot and catch a glimpse of the waves through the trees. The park has several hiking trails and connects with the paved Discovery Trail, for walkers and bikers. We rode our bikes from the North House Lighthouse to Long Beach. Be sure to book early, as this park is very popular. Watch out for low branches on the park roads. We camped at Cape Disappointment State Park in a Fifth Wheel. Be sure to visit North Head Lighthouse. The views are stunning. If you go into Astoria, the Maritime Museum is worth a visit. Arrived in the middle of a storm and some of the sites were flooded, including ours. It's tricky to put pads under your jacks when they keep floating away. Luckily, the storm ended, the site drained quickly, and we had a great stay. The sites are paved with grassy yards. We were very close to the beach and some of Fort Worden's bunkers. We were able to get a satellite signal as well as several OTA channels. We had 1-2 bars of 4G on ATT, but had a lot of trouble connecting. You're supposed to stop at the commons to register but the signs weren't very clear, especially in the rain, so we went back after we unhooked our rig. This is a very popular park so be sure to register well ahead of time. We would definitely come back. We camped at Fort Worden State Park (Beach campground) in a Fifth Wheel. There's a lot to do within the park and Port Townsend is very close. We rode our bikes into town and explored the waterfront. Olympic National Park is further away, but worth the drive. We went to a local fish market and had a crab feast at our picnic table. This park is in a good location to explore the area with lots of shopping near by. The sites are all gravel and fairly level. We had 4 bars LTE with ATT. The Park WiFi was unreliable and the cable fuzzy. Too many trees for a satellite signal from our spot, though some of the sites that were higher up seemed able to connect. We camped at Gig Harbor RV Resort in a Fifth Wheel. Be aware that the bridge to Tacoma is a toll bridge. You only pay on the southbound direction, but it is $6 per car. We didn't go that direction with our 5th wheel, so we don't know how much that would have cost. Beautiful state park on the Columbia River. Sites are paved with grassy yards. We had 4 bars LTE with ATT and numerous OTA channels. The park has upgraded to 50 amp so we were able to keep our rig cool in 100 degree temperatures. They water the grass every day so expect some overspray on the patio and driveway. Our only complaint is that they don't trim the trees very well on the park roads. We encountered some branches on the way out that were unavoidable and about 3 feet too low for our RV. Otherwise, it was a great park. 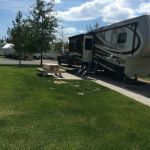 We camped at Wenatchee Confluence State Park in a Fifth Wheel. 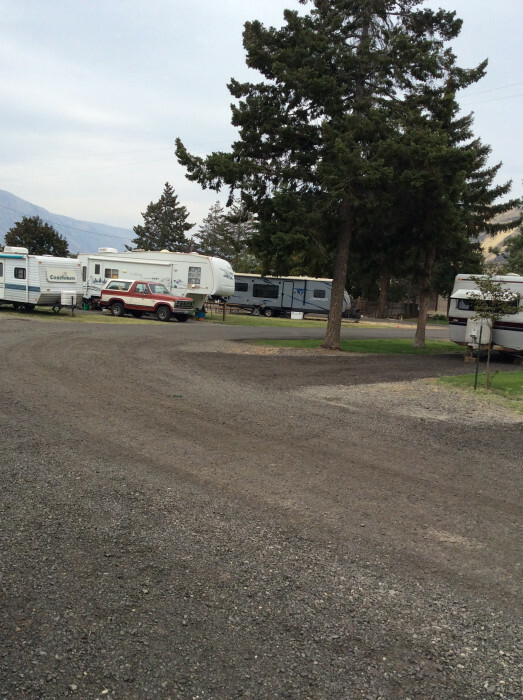 This park is close to Wenatchee and numerous wineries. We loved biking the loop trail which runs right by the park. This was the second time we've stayed here and we didn't have quite the same experience as last time. We were on the A row, I don't remember the exact site but close to A7. 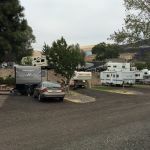 The road is narrow and there are large bushes on the right which makes it difficult to swing wide enough to easily access the site without scraping the side of your RV on the bushes. The lawn was watered every night and the area in front of our steps was muddy the entire time we were there. Also, there was some train noise that we didn't hear last time we stayed. I still like the park but I will ask for a different row the next time we come. 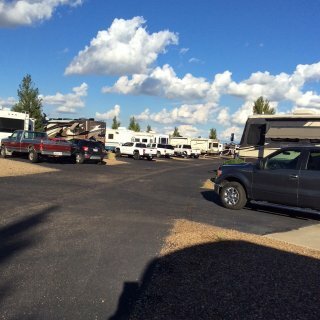 We camped at Jim & Mary's RV Park in a Fifth Wheel. Pretty, well-maintained park with level, gravel sites, patios, and grassy yards. Not a lot of extra amenities such as a pool or dog park, but we were here for Yellowstone NP. The WiFi worked pretty well and we had 4 bars 4G on ATT. We had no problem connecting our satellite. The lady who checked us in was extremely helpful. 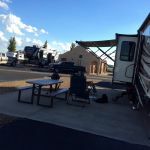 We camped at Yellowstone Grizzly RV Park & Cabins in a Fifth Wheel. There's a visitor information center close by with a desk manned by park rangers. The ranger we talked to gave us a lot of great information including can't-miss sites, road construction, and ranger talks. He really helped us plan our days in Yellowstone.